This recipe by Chef Riccardo Cappelli features Pappa al Pomodoro, a thick Tuscan bread soup typically prepared with fresh tomatoes and stale bread as main ingredients. The dish has ancient origins. Prepare the fresh pasta by kneading the flour and eggs, then let the dough rest for about 1 hour in the fridge. Cut the onion into julienne strips and cook it in a casserole with olive oil and garlic. After adding the tomatoes and half of the basil, cook for about 30 minutes, then pass to the vegetable mill, and season with salt and pepper. In the meantime, cut the stale bread into thin slices, season with olive oil and salt, and toast lightly. Then add the toasted bread a little at a time at the base, let boil and wait for the bread to absorb the liquid. Finally, add the basil. When the soup is cold, roll out the dough and stuff it with the soup. Cut the artichokes into thin slices, flour them and fry them. For celeriac cream: clean the celeriac, dice it and cook it in water. When cooked, blend it and adjust the salt. Clean the prawns and season with salt and olive oil. 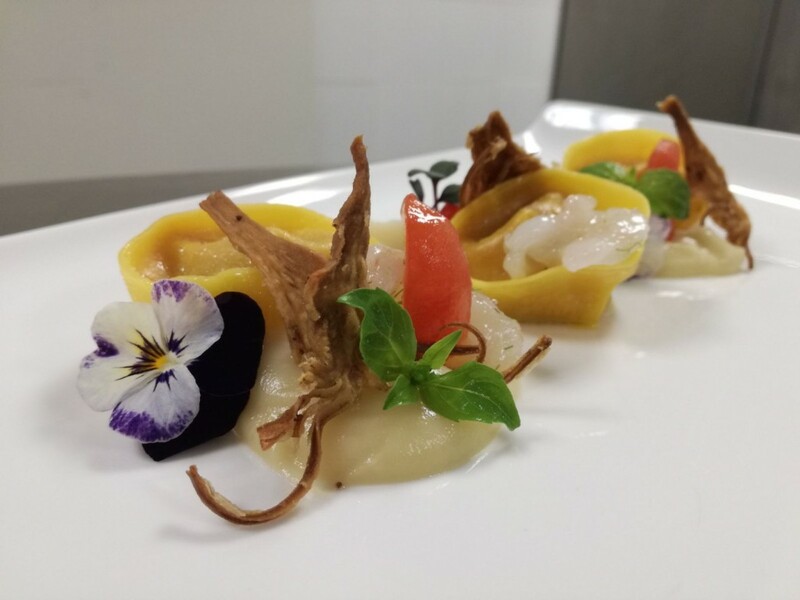 Prepare the dish with the celeriac cream, the ravioli, the fried artichoke and the raw scampi. This entry was posted in Food and tagged food, foodie, recipe . Bookmark the permalink.